The Digital Health Initiative of Philadelphia—What Is It? 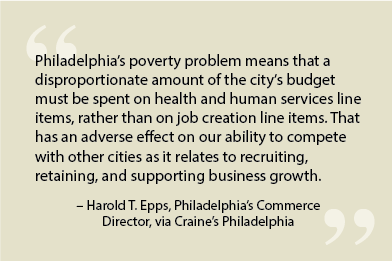 Philadelphia has recently been characterized as “the poorest big city in America.” Among all the negative connotations and implications this designation brings, one that is particularly damaging is the impact on poor communities in the area of healthcare. Residents of poor communities typically have healthcare coverage through Medicaid or are uninsured, receiving care as charity cases or via funds to pay for uncompensated care. A recent Health Affairs study found that through the combination of taxes, fees, charity care, uninsured patients, bad debt, and low Medicaid reimbursement rates, the net costs of delivering healthcare to the poor are only covered at 89% or lower—in other words, organizations were repaid less than the cost of providing the care in the first place. When the proposition of care delivery to the poor is inherently unprofitable, healthcare facilities that primarily cater to those communities will struggle to maintain solvency, and as we’ve seen with the recent bankruptcy of the North Philadelphia Health System, sometimes that struggle is unsuccessful. With over a half million Medicaid enrollees in Philadelphia County, the entire healthcare system in this area is strained due to the costs of managing care for the poor. This investment of resources to care for the city’s most vulnerable population comes at a cost to other areas of investment that would otherwise better the region in several dimensions. Poverty in the city, including healthcare burdens, costs us jobs, new business development, tourism, and other economic growth opportunities. 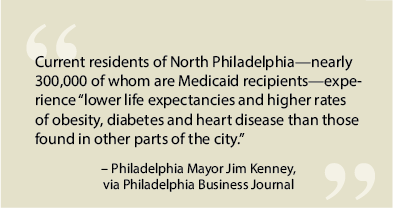 Additionally, a strained healthcare system will not deliver the highest quality care, and the effects of this are seen in the health statistics for Philadelphia citizens—including a sad capstone that in fifteen zip codes in North Philadelphia, life expectancy of children is 20 years shorter compared to their counterparts in wealthier zip codes. But with tremendous challenges come tremendous opportunities for greatness. Philadelphia has the opportunity and the wherewithal to become a national leader in developing models of care that overcome the obstacles in caring for challenged populations. Now is a unique time when the convergence of healthcare payment reform, advances in digital health, and the will of the country serve as a springboard we can use to better the lives of our citizenry, and to advance on the national stage in both healthcare and technology. Specifically, a partnership among the major stakeholders in this region can catalyze progress and magnify the impact of healthcare delivery not only in Philadelphia, but ultimately in all urban centers that follow our lead. The Digital Health Initiative of Philadelphia (DHIP) is galvanizing our business, political, technical, and social communities in this charge toward greatness. Philadelphia is a city rich with a wide range of healthcare and technology assets, making it an ideal place for digital health to flourish. There are several world-class universities with top-tier technical and healthcare programs. There is a large and growing millennial population to draw from as a source for labor and innovation. There is an abundance of nationally ranked hospital systems and managed-care organizations in and around the city. There is a vibrant community of venture incubators, seed investors, and technology start-ups focused on healthcare IT. Perhaps most importantly, there is a large and diverse population of residents with rich healthcare scenarios and needs to address. This critical mass of key enablers gives Philadelphia the potential to be a major contributor to the advancement of not only digital-health innovation, but to new models of demonstrably better care delivery derived from this innovation. The entire healthcare system in the U.S. is also in a period of significant evolution. The current Medicare system will be strained with retiring baby boomers, spawning various payment-reform efforts. Medicaid is under similar pressure as sustained funding for Medicaid expansion under the Affordable Care Act is thrown into uncertainty due to the political transition in Washington. The entire industry is moving toward payment reform, and more specifically, toward risk assumption by care providers. This model of risk assumption—called fee-for-value—is steadily eroding the traditional fee-for-service paradigm where providers are paid for all services rendered without regard to efficacy or outcomes. This shift uncovers opportunities for healthcare providers to more efficiently manage patient episodes to lower their risk profiles, giving rise to opportunities for digital health applications to support this model. Digital health in the Philadelphia area, therefore, can be an enabler for our local health institutions to collaborate and to apply contemporary techniques to improve care. Strong minds from the medical, behavioral, human services, and technical domains are co-resident here to enable world-class healthcare applications and leverage them into emerging workflows that optimize new payment-reform initiatives. This document describes the DHIP initiative and a way forward for the city to emerge as an unqualified leader in the digital health space—and in the process to accrue the benefits of this leadership, such as creating jobs, attracting residents and businesses, and optimizing healthcare.